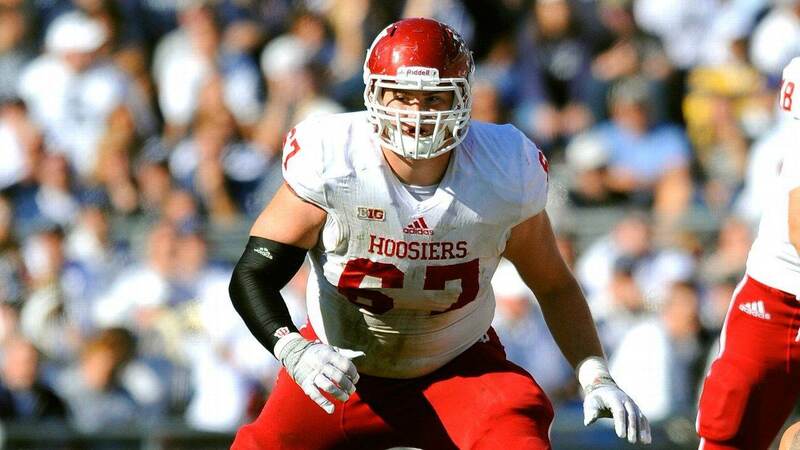 Through his time at Indiana, Dan Feeney was the consummate professional (well, besides getting paid). He did everything he was asked to do, even moving out from guard to right tackle when injuries to teammates forced him to play a position he had never played before. Earning first team all conference honors in both 2015 and 2016, Feeney still only allowed one sack all season despite playing four games at tackle. Over his entire college career, Feeney only allowed two sacks, making most of his living at right guard. Feeney is a guard in the NFL, and will be a really good one at that. He is an extremely powerful player who is strong and technical enough to power defensive tackles off the ball and drive them into the second level. What separates Feeney from other guards in this draft class, however, are his athleticism, footwork, and body control. When asked to move laterally like he does here, Feeney is able to smoothly move his feet and hips, staying square and keeping his inside arm strong. This play is a perfect example of Feeney’s footwork and power. He keeps his inside arm firm, refusing to allow the defender to spin or rip back inside. His feet are smooth and fluid in run blocking as well, helping him to remain balanced down the line of scrimmage. Feeney’s core strength is also impressive, which helps him to remain balanced even when not getting his hands on first. Speaking of his hands, Feeney’s hand work and grip strength are both exceptional. Rarely does he lose defenders once making contact, which is a testament to both his fluid hips and powerful hands. As you can see here, Feeney does an excellent job of getting his hands inside and overpowering smaller defenders. When matched up with a linebacker or defensive back, Feeney salivates, and uses his power to drive them down the field. Feeney stands at 6-4 310 pounds, so size and strength are certainly not lacking from his game. Dan Feeney is also great in space. When pulling, he does a fantastic job of staying square, keeping a powerful base, and remaining balanced on contact. His ability to block in space make him an intriguing prospect for a zone blocking NFL team. In pass protection, Feeney also excels. Better inside than out, Feeney is powerful enough with his punch to stop defensive tackles at the line of scrimmage, and then good enough with his feet to adjust to stunters. Feeney’s feet always remain active and never die on contact in pass protection. There are a few downsides to Feeney’s game at this point, however. He sometimes gets too aggressive, and can allow his emotions to get the better of him. I don’t have much of a problem with drafting a nasty offensive linemen, though. While his feet remain active in pass protection, he sometimes allows his feet to die on contact in run blocking, which can lead to stalemating. He overcame these problems with his overall power, but this may not be the case in the NFL. I have a first round grade on Dan Feeney, and he is currently my number two rated offensive guard behind Forrest Lamp. While I think Lamp has the greater upside, Feeney is another plug and play guy who should be a model of consistency in the NFL. There are currently no dire problems with Feeney’s game. Yes, he can clean up some things on the technical side, but with NFL coaching I see no reason why Feeney can’t make it in the league. It would not surprise me whatsoever if Feeney became a 10-12 year veteran in the NFL, starting at right guard for a franchise for a very long time. Feeney is a physical, nasty interior offensive linemen who can drive defenders into the ground. He will be welcomed with open arms by an NFL team this Spring.